In years past, Louisville’s success has been predicated on the strength of its pitching. As 2015 comes into fruition, nothing has changed. Led by juniors Kyle Funkhouser and Anthony Kidston, Louisville’s pitching staff will be the strength of their 2015 season. In a typical weekend series, Funkhouser will be the Friday starter and tone-setter for the weekend. Kidston, a captain, will be the starter on Saturday. Sophomores Josh Rogers and Drew Harrington round out the rotation. Coach Dan McDonnell will look to Harrington to also contribute in relief efforts during the weekend series. 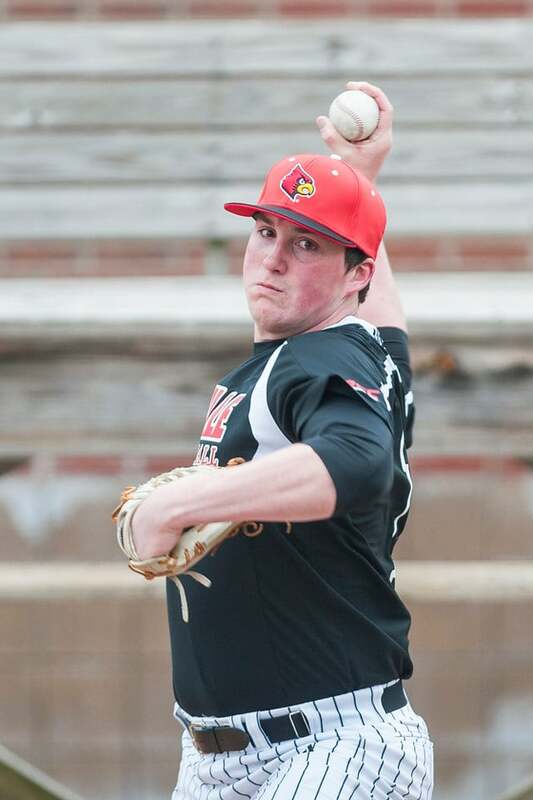 Funkhouser is coming off one of the best pitching seasons at the University of Louisville. His 13-3 record was the most wins in a single season a pitcher has ever had for the school. His 122 strikeouts ranked third most in school history and his 120.1 innings pitched placed him second all-time at U of L. He also posted a 1.94 earned run average and was invited to play with the USA National Collegiate Team in the summer. While “Funk” is the most decorated pitcher of the staff, receiving multiple pre-season All-American honors, the rest of the staff is just as capable of putting up big numbers. Kidston is entering the year with a career record of 14-1 in his two years with the Cardinals. His ERA is 2.60, and he had 127 strikeouts. In his freshman season, Josh Rogers posted a 3.63 ERA and had a 3-3 record with 47 strikeouts. He also played a key role in the post-season, with back-to-back quality starts to close out the year. Of course, the starters aren’t the only key players on the pitching staff. A deep bullpen will take pressure off the starting arms. “To get to Omaha, in 2012 it’s Kyle Funkhouser running out of the bullpen against Vanderbilt, and in 2013, it’s Nick Burdi running out against Kennesaw State,” Kidston said of the importance of the bullpen. “Obviously we have good guys on paper, but I think it’s the freshmen, the younger guys who have shown the ability to step up. And to make a tournament run, that’s the most important thing. “At the beginning of the season you’re not really sure, but halfway through, you get your roles set up. That’s where I think we’ll shine this year,” he added. Despite losing star closer Nick Burdi to the Minnesota Twins in the second round of the MLB Draft, the Cards can look to another Burdi, Zack, to shut the door this year. Another pitcher who has the ability to provide a spark out of the bullpen is sophomore Robert Strader. The pitching staff could breathe a sigh of relief as pitching coach Roger Williams returned to the team for his ninth season amidst staff turnover. Williams’ impact on the pitchers cannot be understated; neither can his relationship with McDonnell. “It’s very comforting for me because I know Roger is going to get the most out of these guys,” McDonnell said. Williams has been McDonnell’s pitching coach throughout his entire tenure at Louisville. “I can’t even put it into words. That guy’s basically like a second father to me. The relationship he has with his players, I can’t even describe it,” Kidston said of his pitching coach. Entering the ACC, the Cards will pit their pitching staff against some of the best in the country. The Cards have had the Conference Pitcher of the Year five times in McDonnell’s eight-year tenure. However, despite having one of the best pitchers in the nation in Funkhouser and a talented staff top to bottom, McDonnell isn’t looking to add a sixth Conference Pitcher of the Year to his résumé. Despite the challenges, the Cards pitching staff is excited about the new conference. ““I like going to away places and pitching in front of big crowds and letting them heckle you a little bit. It gets you going a little bit,” Kidston said. In light of the tough competition they will face, if history has shown anything, the Cardinals pitching staff is ready to rise to the occasion.